So, Citizens of Hull 2017, can you imagine the future? A Team of Experts & Visionaries from C4DI reimagine Hull's future for City of Culture's prestigous event - Substance Future Forum. Below we'll cover some of the key concepts discussed, the background to the event and the process behind delivering the vision. Our incredible year of culture has undoubtedly touched the hearts of thousands and without question, forever changed the lives of many in and around our brilliant City. A year of the breathtaking artistic commissions has taken all of us on an incredible journey of 'seasons'. The first starting with a 'bang' and then bringing tears to our eyes with the powerful and inward-looking projections of the 'Made in Hull' season. The final and current season 'Tell the World' will be more outward looking. With 2017 drawing near to a close and a new City of Culture 2021 announced yesterday (well done Coventry! ), the question on everyone's minds is turning to 'what happens next?'. With the aim of stimulating fresh, forward facing thinking 'Substance' - "A new festival celebrating the culture, creativity and future of the North" has begun - marking a new, future focussed, Chapter of the City of Culture story. We were delighted to be asked by James Trowsdale, Head of Public Partnerships for City of Culture, to contribute our ideas and experience via the 'Substance Future Forum'. Tasked with tackling this formidable challenge we started by forming a team of experts and visionaries handpicked from our community and lead by Hull's Digital Ambassador, the region's biggest fan of pot noodle ... if you haven't guessed it yet ... it is of course, our Chair, David Keel. "The C4DI’s participation in the Substance Symposium was our community’s opportunity to celebrate the spirit of our time as UK City of Culture by presenting the combined knowledge and experiences of a large number of our members and associates in a fun and creative way. To support our project City of Culture also provided us with a task force of experts to give critical project guidance, support on the production and artistic direction. This included City of Cultures Executive Producer - Sam Hunt, Producer - Martin Atkinson and Alex Mitchell, Artistic Director of Silent Uproar Productions. Our Approach: How do you begin to define the vision for a City? With much of the Substance event dedicated to defining the cultural and artistic vision for the North, the team at C4DI turned its creative cannon towards articulating the industrial vision of the city and its place in the North. Natural resources such as Hull's proximity to water. Economic resources such as RB - the global leaders in consumer Healthcare and Siemens Gamesa - Renewable Windpower Experts. Social Resources - our pioneering attitude and capacity for culture, adventure and play. Infrastructure - KCOM's World Leading Fibre Communications. We then began to understand some of the challenges that Hull faces - including its relative isolation from other cities, poor levels of education & public health and an over-burdened transport infrastructure. By applying the lens of technology and innovation to the challenges we faced and combining all these elements together with global trends we began to form a narrative where our key strengths began to surface. After many late nights and hundreds of hours of work, our collective vision was finally defined. Under the guidance of Artistic Director, Alex Mitchell, we were able to craft our vision into a 45-minute creative performance, designed to transport the audience 25 years into the future to Hull, the UK's Capital for Technology & Digital Innovation. 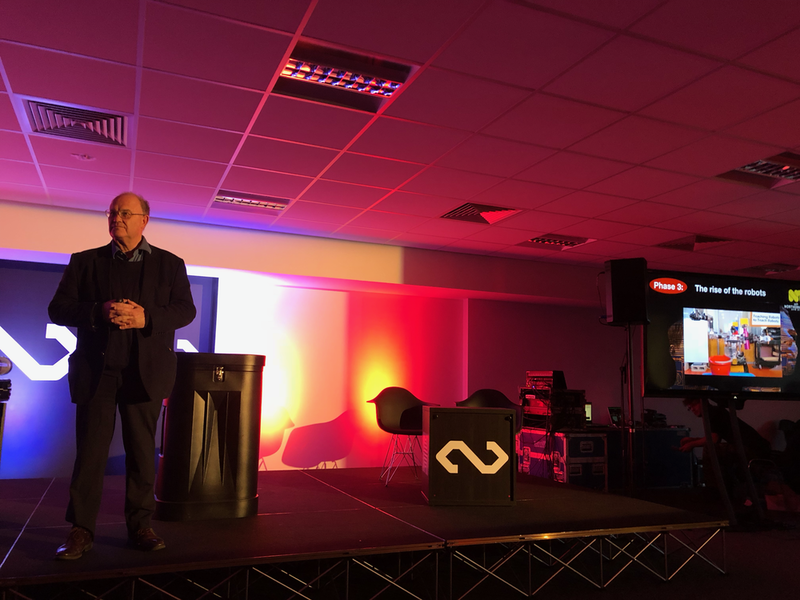 Here they would join some of the planet's smartest people (played by some of the sector experts we had gathered in the process of creating our vision) at the 'Northern Tech Expo 2042' and experience this bold vision of the future for themselves. The session that C4DI produced was an example of what can be created through collaboration. Not only did it wave the flag, highlighting the sheer talent and innovation that is present in Hull it also showed just how important people working together can be, taking everyone out of their comfort zone and giving people a chance to dream. Crazy, brilliant, exciting, funny, bold and ambitious dreams that led to a real revolution. Artists, digital pioneers, entrepreneurs and social commentators participating and working together as part of Substance was crucial to Substance having even the slightest chance of success and C4DI brought all those elements to their session. A major achievement that takes a lot of hard work. Martin Atkinson - Producer at City of Culture. With the vision defined December 7th, the day of the Substance Future Forum, was upon us - along with it our collective opportunity to share a declaration of what Hull can achieve, to the world. We managed to distil the thinking of more than fifty experts, from the C4DI community, into ten four-minute acts summarising eight concepts. Delivered by: David Keel - Chair of C4DI, Dileepa Ranawake - C4DI Community Manager & Sarah Louise Davies - C4DI Artist in Residence. In 2042 Hull's culture of adventure, play and discovery has led it to become the UK's capital for technology and digital innovation. It has transformed its relative isolation from other cities into its own USP - becoming a sandbox and a testbed for emerging technologies. Technology was an essential catalyst that enabled Hull's rapid development. Delivered by, Bruce Charlesworth, VP Global Head of Health Relief, RB. Bruce introduced us to a future where Healthcare consultancy is now virtual and the majority of diagnoses are made in millionths of seconds by a combination of 'computer programmes specialising in healthcare' and advanced sensors that diagnose problems before they are acknowledged by patients. Hospital queues (and hospitals) are a thing of the past. Instead, treatments are delivered locally to patients in the comfort of their own homes. By 2042, lifespans of 150 are the norm. Delivered by: Eryl Stafford, Director of Engineering Operations, KCOM. Building upon the legacy of Hull's incredible communications infrastructure (Hull's existing ultra-fast fibre network) Eryl describes a future where '8g' networks offer seamless connectivity where everyone, everything, everywhere is connected 24-7. This is a critical enabler and foundation that underpins many of the other technology forecasts in the talk. We asked Eryl: "How did you find the experience and does it make you inspired for Hull’s future?" Delivered by: Rob Miles, IT & Robotics Author. Hull is now a city with its own OS (Operating System). It has become connected, self managing and even exportable with citizens of other cities being able to virtually experience the brilliance that is 'Hullness'! The services, infrastructure, industry, people (and Robot inhabitants!) are all connected. Delivered by: Jason Speedy, Siemens Gamesa Plant Director. By leveraging its tremendous coastal natural resources Hull is now able to become the UK's first energy neutral city. Powering much of the UK through its North Sea wind farm Hull is now an energy exporter. The cost and risk of windfarm maintenance have reduced exponentially with the introduction of drone technologies. Delivered by: Calie Pistorius, Chief Executive of DeltaHedron. Ed(ge)ucation by Calie Pistorius, Chief Executive of DeltaHedron. Phase 1 - What we thought would happen. Technology and availability of Information helps us learn more quickly. Phase 2 - What really happened. Humans are augmented with advanced technology such as memory chips. Phase 3 - 2042 and beyond. Robots have reached parity with humans and are able to consume information far more rapidly than humans so they are teaching us! Delivered by: Christina Colmer McHugh, MoodBeam Director & Journalist. Moodtracking technology developed by the Hull startup MoodBeam has enabled the world's first true, digital happiness index - the 'MoodBeam Index'. "Substance was an amazing affirmation for what Moodbeam could become. The fact that it is totally achievable and believable will spur us on to perfect and create a happiness index the world will embrace and use to their benefit. Thank you for helping us envisage 25 years from now." - Christina Colmer McHugh, MoodBeam Director & Journalist. Delivered by: Scott Pilgrim, BimSense Director. Hull's record breaking connectivity has enabled a plethora of smart-city tech to be tested, developed and embeded into the city. Houses now 'protect' inhabitants helping them by diagnosing health problems. In 2032 this enables Hull to become the happiest and healthiest of the major cities - as indicated by the MoodBeam index. Delivered by: Darren Crombie - Director at Upstream Health, Adam Bovan - Director at Singularitee, Tim Evison Manager at Eon Visual Media. Delivered by: Caleb Foster, Director of Mindboost Learning & Extras. In a dramatic, dystopian finale to the performance, a mob chanting "Be the Cure" stormed the event to remind us that technology unchecked can wreak havoc and that disruption will forever be a day-to-day part of the digital and tech industries. See the video below for the finale! "What part will you play?" Thank you to all those involved in supporting the event: Our Presenters, The COC team, RB, KCOM, Siemens, Sonoco Trident, Wykeland, CHCP, Gauri, TH3 Design, ESP, Eon Visual Media, eskimosoup, Pace Comms, and so many more of our brilliant members and businesses! Blog by Dileepa Ranawake - Community Manager at C4DI. Watch the MOB Video Below! City of Culture, Substance Future Forum, Video Finale, Be the Cure!